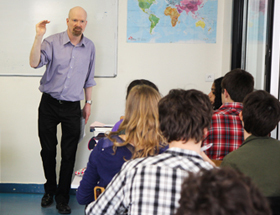 In the International Section of the Middle School and High School, which follows the French curriculum, we prepare students from Grade 6 onwards for The International Option of the French Baccalaureate (OIB) which has been at the heart of our school curriculum for ten years and which is a truly bilingual and bicultural program for French bilingual students and native English speaking students. The two year program combines the breadth and rigor of the French Baccalaureate with two extra subjects, English Literature and History/Geography, taught and examined exclusively to A Level or Advanced Placement standard in English. The diploma is jointly certificated by the American College Board and the French Ministry of Education, providing students with a university entrance qualification valid in France, Britain and the United States. At the end of Grade Nine in the Middle School, students can already take the International Brevet examination certificated by the French Ministry of Education, an international diploma which leads to the OIB preparatory track of the High School. The OIB program makes academic and linguistic demands to an equal level in English and French. Students who succeed in this dual curriculum develop a capacity for hard work, and acquire an intellectual and cultural flexibility that gives them the potential to become excellent ndergraduates in Britain, France and elsewhere. International Option candidates are not just enviably fluent in at least two languages - every day they face the demanding task of working to a native-speaking standard in two languages, balancing from one hour to the next the language and perspective of two cultures. The qualities of flexibility, tolerance and independence students develop clearly make them ready for the challenge of university work. As an alternative course to the OIB diploma preparation, Ermitage also prepares students for the International Baccalaureate Diploma Program (IBDP), a qualification certificated by the Geneva-based Board of Education renowned the world over.